Below is information about the "ღ Keith Urban Fans ღ" asylum on InsaneJournal. To join this asylum, click here. You may leave the asylum at any time. On BE HERE - Keith Urban's powerful and deeply felt follow-up to 2002's double-platinum Golden Road -- his heart and soul as a man and a musician comes through loud and clear. Where does a guy go after making an album that's been on the charts for more than 100 weeks? If you're Keith Urban, you go deep. As a songwriter, you put more of yourself into your music than ever before. As a vocalist, you sing with newfound passion and commitment. Already recognized as a true guitar hero, you play your instrument with even more fire and skill. "For me, it's just a matter of getting more comfortable in my own skin," Urban confesses. "I hope that there's more of me coming through in the music. I think that comes from getting comfortable with myself as a person and as a musician, but also from getting comfortable in the studio. In the end, all you can do is live and learn." BE HERE, co-produced by Dann Huff and Urban himself, is music from a young man who's lived a little, loved a little and battled a couple of demons along the way. There are songs here for the good times, such as "You're My Better Half," "Making Memories of Us" and "God's Been Good To Me." And there are songs that speak to life's darker patches, like "Tonight I Wanna Cry," "The Hard Way" and "Nobody Drinks Alone." From the driving opening track "Days Go By" (the album's first single) to the graceful reprise of "These Are The Days," Be Here offers the sound of a gifted singer-songwriter and world-class player embracing life and savoring the chance to play another day. You expect a great deal from country radio's most played artist of 2003, a famously crowd-pleasing live performer with a remarkable track record of four #1 songs and eight Top Five hits -- all of this accomplished with just two solo albums. And now on BE HERE, Urban delivers more than ever before. While the songs sound as accessible as ever, BE HERE is Urban's most personal and deeply felt work to date. This is music for living life in the present tense. "If there was a theme to this album, it would be the big questions I ask just like anybody else: What are we doing here? What's life about?" says Urban. "These days, I think more about the brevity of our time here. So it seems to me that making the most of every day is really crucial." Keith Urban grew up loving country music in another country -- Australia. "We moved around a lot in the city of Brisbane when I was very young," Urban remembers. "Then my dad decided it was time to get back to his rural upbringing. He bought a property in a place called Caboolture, a farming town about an hour north of Brisbane. We moved up there and lived on this 12-acre farm. We had our own cows for milking -- well, one cow, singular, to tell the truth. He wanted our family to be self-sufficient from the land." From the start, Urban took to his parents' country records collection -- Don Williams, Glen Campbell, and Charley Pride, among others. And before long, young Keith was playing along. By age seven, Urban was already thinking about coming to America and making his mark in Nashville, Tennessee. "I inherited this kind of love for the American dream," Urban explains. "I fell in love with the music, the cars and the whole idea of America." At eight, Urban started winning country music talent shows. By twelve, he was booking his band in local clubs, and at fifteen, quit school and hit the road. In 1990, Urban signed with EMI in Australia and recorded his first solo album, which charted four No. 1 country hits over there. Finally, Urban decided the time had come to move to Nashville in 1992. Once in Music City, Urban made some industry buzz with a three-piece group called The Ranch. But after releasing one album in 1997, Urban was ready to leave The Ranch and move on as a solo artist. 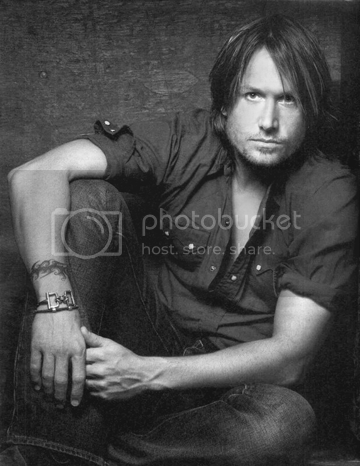 In 2000, Keith Urban, his self-titled debut in the United States, became a real breakthrough effort that established Urban as one of country's brightest talents. The album, co-produced by Matt Rollins and Keith Urban, featured three Top 5 hits, including the No. 1 hit "But For The Grace of God". In the wake of that tremendous success, Urban won the Country Music Association's prestigious Horizon Award in 2001, as well as the Top New Male Vocalist Award at the 2001 Academy of Country Music Awards. As if that wasn't enough, his highflying instrumental performance on "Rollercoaster" was nominated for a Grammy Award, and all of this in the midst of two years of non-stop touring. When it was released in 2002, Golden Road became another great leap forward. The album went Gold(r) in eight weeks and spawned a wildly impressive run of hits including "Somebody Like You," "Raining On Sunday," "Who Wouldn't Wanna Be Me" and "You'll Think of Me." "Somebody Like You" spent eight consecutive weeks at the top of the charts, remaining at #1 longer than any other country artist in 2002. The album has now gone at least platinum in every country where it's been released and is now double platinum in the United States. Now with the release of BE HERE, Urban is excited to hit the road and be wherever the music takes him. "I can't wait to get on the road and play these songs live," he says. "There's a lot to be said for having toured so much since Golden Road came out. I think all that roadwork helped us in making BE HERE. And even now, Urban doesn't mind having to win new fans on the road. "It's a daily challenge, ya know, you gotta rise to the expectations, those of your own, of those who've seen you before, and the friends they've brought along, especially the ones they've dragged along." With BE HERE, Urban has made the most ambitious and heartfelt music of his career to date -- a song cycle that reflects Urban's great musical range and personal point of view as never before. But like all great music, in the end, ultimately it's all about expression and communication for him. "We want our music to connect with as many people as possible," Urban explains finally. "That's what it's about for me -- giving all I've got to lift spirits and raise the roof." --- Biography comes courtesy of Capitol Records Nashville.